I nodded in agreement. Samarkand is indeed a stunning city. No other Silk Road city evokes as many images and legends as Samarkand, none has been written about as much. But Uzbekistan is not only about Samarkand. Dive deeper and you will find out that there are many more things to discover in this country. Ask travellers which Uzbek city they like most and you will see that half of them prefer Bukhara while the other half likes Samarkand better. Me, personally, I would vote for Samarkand. The Registan is stunning by day and by night, you can see Timur’s mausoleum and learn about the country’s history in Ulugbek’s observatory. 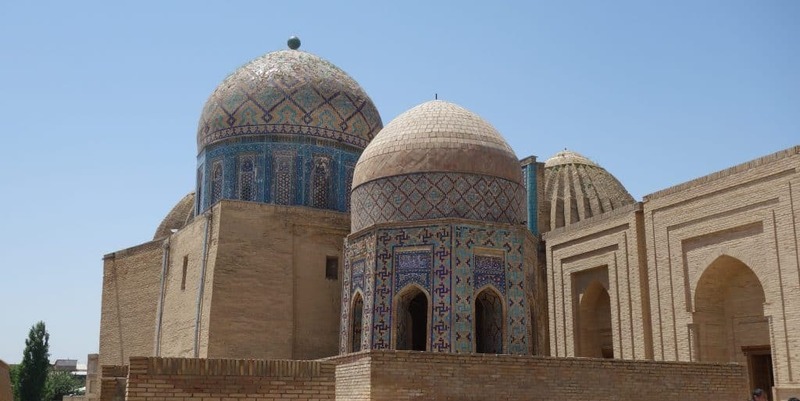 And don’t forget the avenue of mausoleums, one of the most stunning examples of Silk Road architecture. Where else will you see as many blue-tiled buildings next to each other as here? Bukhara is another stunning example of Silk Road architecture. But while the medressas and mosques are stunning to look at, the real pleasure comes from sitting at Lyabi-Hauz and enjoying a cool drink. 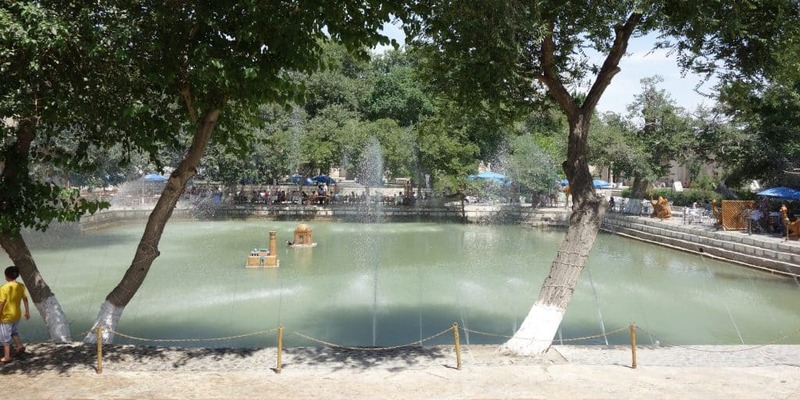 Bukhara used to have hundreds of public pools, water basins where the locals flocked to take a bath or fetch drinking water. These days, only a few of them remain. Lyabi-Hauz is the biggest one. Come here during the day to sit in the shade and enjoy a cool drink. Come in the evening to people-watch as this is where locals gather. 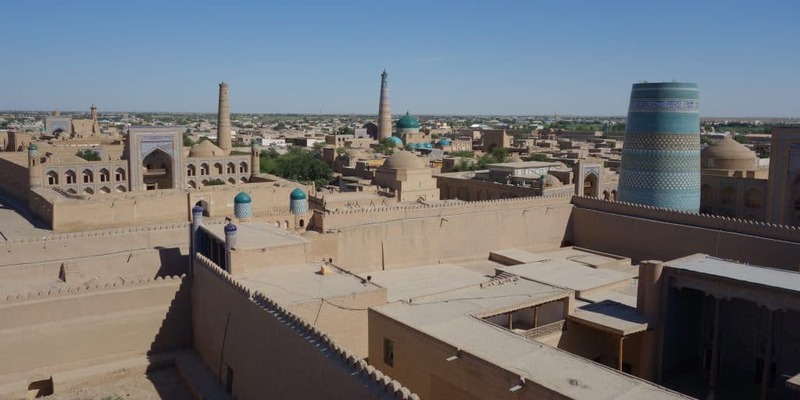 If we talk about Silk Road cities, Khiva has to be mentioned along Bukhara and Samarkand. It is different in its layout, with all the sights clustered together in the old town, but it is just as stunning. One of the big sights in Khiva is the Ark. Don’t forget to climb to its top. While the entrance to the top isn’t included in your 2 day ticket, it is worth paying for. You will get a great overview of the maze of the old town and can admire the architecture from a different angle. 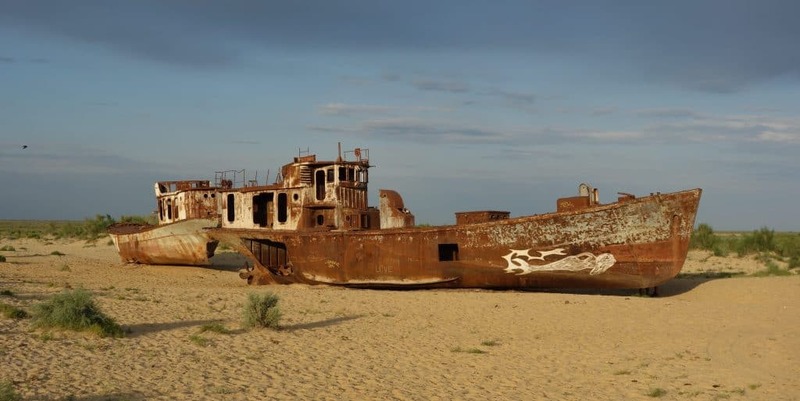 The Aral Sea is considered to be the biggest man-made disaster in human history. Due to cotton irrigation, the sea has shrunken to a fraction of what it used to be. Travel to Moynaq, an almost abandoned city that was once a thriving fishing town, and climb down to what used to be the bottom of the Aral Sea. There, amidst the rusty ships, the extent of the environmental disaster truly sinks in. Did you know that Ulugbek was one of the most important astronomers of all times? Besides being a brilliant scientist, he also was a ruler and played an important role in constructing medressas and supporting research. The Registan was built during his time, too. The observatory in Samarkand might be a little distance away from the city centre but is worth visiting if you want to have any idea of the important role that Uzbekistan once played. Plov is one of the staples you will find everywhere along the Silk Road. 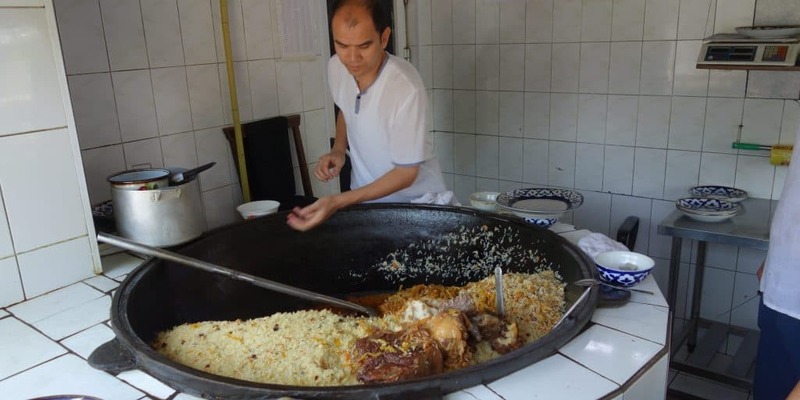 It consists of rice and vegetables, often with meat added on top. Each country has its own variations and each restaurant will once again serve you a different version. The plov we had in Tashkent, at the Central Asian Plov Centre, was without doubt the best plov we’ve had in the whole of Central Asia. They prepare a giant pot from which they will serve you. Servings are huge and you have the option to add horse meat if you like. The Savitsky Museum in Nukus houses the biggest collection of art banned by the Soviets. Nobody would ever expect more than 8.000 pieces of art in this sleepy town, which is probably the reason they were never found during the Soviet era. These days, the museum exhibits a selection, with the pictures on display being changed regularly, so no two visits to the museum will ever be the same. Don’t get me wrong. Khiva is a stunning city. 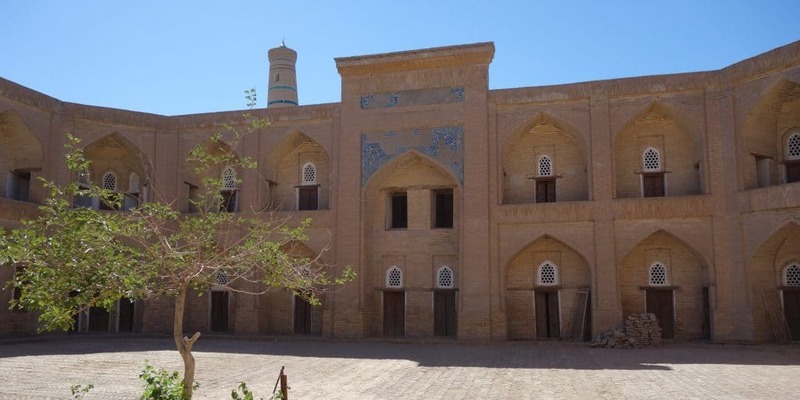 The architecture is amazing, the city can easily be explored on foot and you only need to buy one entrance ticket to get into all of Khiva’s museums. Some of the museums have stunning interiors or are historically significant. And then you will stumble upon others that are just bizarre. The Nature Museum, for example, with exhibits of a potato labelled ‘potato’. And don’t forget about the ugly sheep or the babies in a jar. 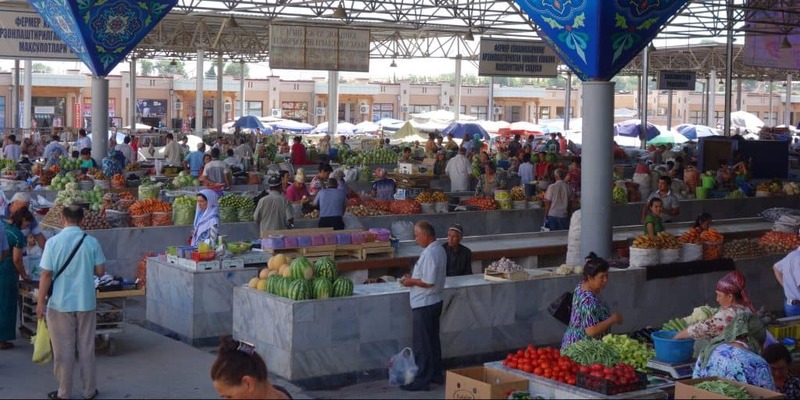 You cannot travel to Uzbekistan without going to a bazaar. No matter which city, you will always find a bazaar in or near the city centre. Walk across the different sections to take in the whole range of products, from dried nuts to raw meat and fresh noodles. Also take a look at the fresh fruit. I paid less than a dollar for a whole cup of fresh raspberries. While I did not get a chance to go here, I wish I had. The Fergana Valley is a remote valley in Uzbekistan, a day’s drive away from Tashkent. The scenery is supposed to be stunning and it is unlikely that you will stumble upon many other travellers here. If you go, please let me know if you enjoyed it. Nice article, Ilona! I remember reading about the Aral Sea as a kid, but I had since totally forgotten about it. It’s almost unbelievable that something like that could happen. Thank you, Andrew! Yes, the Aral Sea is a disaster. Seeing those rusty ships made me realise just how easily we can destroy nature.